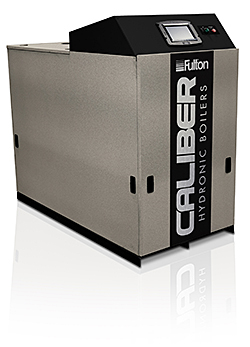 The Caliber™ is a lightweight, commercial, hydronic boiler that features ultra-low emissions of carbon monoxide and nitrogen oxide. The product features a full heat exchanger suitable for hydronic heating. The boiler is equipped with a Honeywell SOLA control and a variable-speed premix combustion system capable of a 5:1 turndown. The new hydronic offerings include low-emissions products with greater than 92 percent thermal efficiency from 300,000 Btu per hour up to 6 million Btu per hour with the Vantage condensing hydronic boiler.